Provide the text area with a title here. Opens a dialog where the title can be entered in multiple languages. More information about this topic can be found here. The text area becomes a mandatory field. Adjusts the width of the text area to its surrounding elements. On pages transformed for mobile devices, you will also see this setting in edit fields connected to numeric data fields. This shows a numeric keypad in the mobile end device which can be used to select and enter numbers into the field. When entering the text, hashtags can be created by inserting a "#" in front of the desired characters (e.g. "#mytag"). When the text is saved, the hashtags will be extracted and saved. The hashtags can then be depicted by the View tagging - Bookmarks element. The text can contain as many hashtags as desired. When text is entered with a hash symbol (#) in front of it, a tooltip will display suggestions based on existing tags. Clicking on this suggestion will insert it as a hashtag. 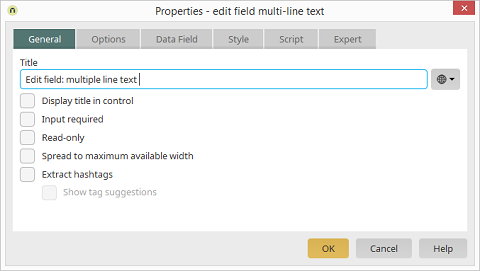 With this setting, the options "Use TinyMCE" and "Use Markdown editor" cannot be activated on the Options tab. Tag suggestions cannot be displayed in the editors.